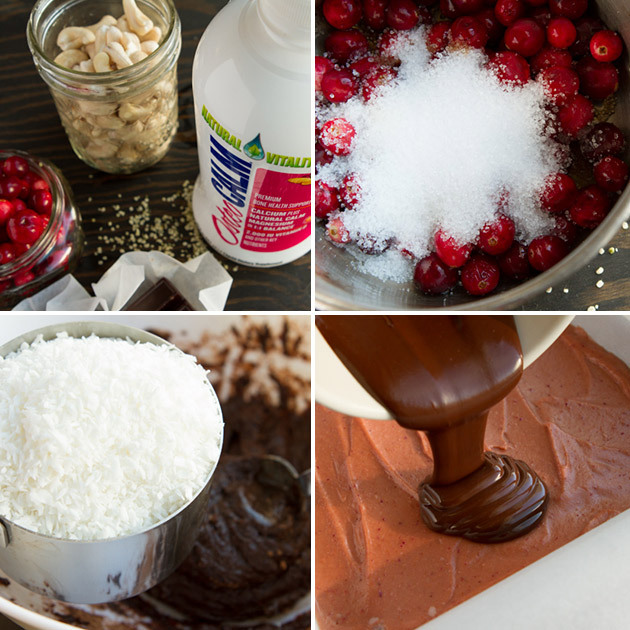 Lightly sweetened chocolate-layer bars—a healthy hemp-seed base and melted chocolate coating, sandwiched between a dense layer of cranberry cream. Wow, what a Christmas! Were you following along with me? My family and I made gluten-free gingerbread houses, drank spiked dairy-free eggnog, slathered cranberry sauce on everything, blasted the Christmas music, kissed under the mistletoe and marveled in each others company. It was grand! The status this morning – we’re up to our elbows in leftovers and I have a pile of 6 bags of fresh cranberries sitting on my counter. Why I thought it was a good idea to buy every darn bag of cranberries I could find is beyond me. But something tells me… I’m not the only one in this predicament. 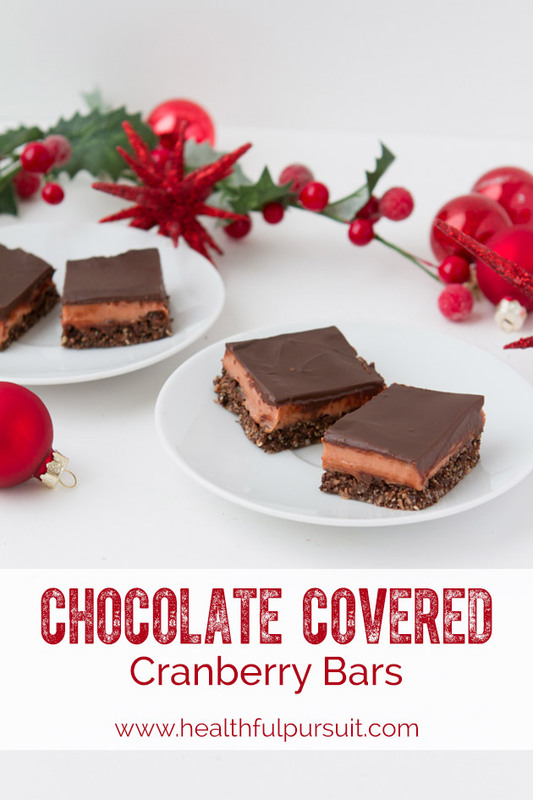 And, since “technically” the holiday season runs right through to January 2, I think we should all take a bit of time today to whip up a batch of these Chocolate Covered Cranberry Bars that I created for Natural Vitality. This is a new recipe — packed with all the nutrients you need to build strong bones. 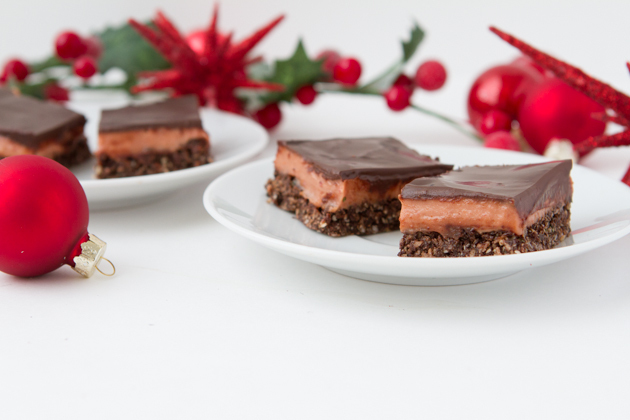 Strong bones in a chocolate-covered treat… has my vote! This recipe contains Osteo CALM – a bio-available liquid supplement from Natural Vitality that contains all the minerals necessary to maintain healthy bones. If you do not have Osteo CALM at home yet, try replacing it with dairy-free yogurt or milk. I want to hear all about your Christmas! 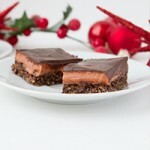 Was there a healthy appetizer, dish or dessert that you shared with you friends and family that really blew them away? If you found it challenging to find food options that worked with your eating style, how did you overcome obstacles?